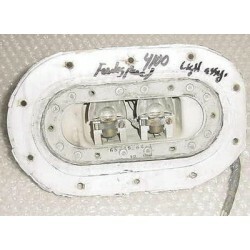 Boeing 737 Aircraft Fuselage Panel Light Assembly as shown on photo. Manufactured by Grimes. P/N 30-0181-7. It operates on 28VDC. It measures 5 3/4" by 9 1/2". It was removed from a salvage aircraft. 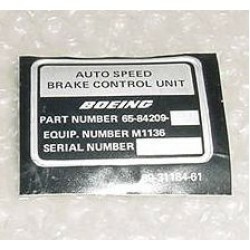 New, nos, Boeing 737 Aircraft Auto Speed Brake Control Unit Decal / Placard. P/N 69-31184-61. Pratt & Whitney JT8D Engine Stator Vane. It measures 15" plus across. Visually it checks out ok but I have very limited knowledge about it. I have no paperwork for it at all so it is sold as a display item, as is. It seems to be made of titanium which makes it almost a commodity due to the value of titanium. It would make an excellent show and conversation piece for the office or home. The Pratt & Whitney JT8D is a turbofan Engine installed on several civilian aircraft such as Boeing 727, Boeing 737, Douglas DC-9, McDonnell Douglas MD-80, etc. and is flying today all over the world. Sold as is, no returns. Pratt & Whitney JT8D Engine Stator Vane. It measures 15" plus across. Visually it checks out ok but I have very limited knowledge about it. I have no paperwork for it at all so it is sold as a display item, as is. 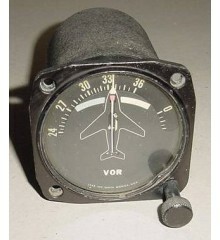 It seems to be made of titanium which makes it almost a commodity ..
Boeing 737 Drift Angle / Ground Speed Indicator. manufactured by Bendix. P/N INA-12B2. Very clean item. It would make an excellent show item of the office or home or as a mock up panel instrument. 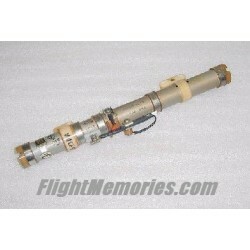 Vintage Boeing 737 Aircraft Fuel Quantity Transmitter, Capacitor type, tank unit. Manufactured by Simmonds Precision. P/N 391046-176. Boeing P/N 10-60520-18. It was removed from a salvage aircraft.